Far fewer coins were struck for circulation in August than in any other month this year, coin production figures from the United States Mint show. 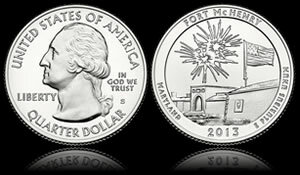 Also revealed by the Mint were mintages for the 2013 Fort McHenry quarter. Historically, August is often a tepid coin production month. On cue, this last one reached 724.91 million coins, sharply snapping a streak of four straight monthly gains of at least 1 billion coins. Federal Reserve Banks always order more pennies from the U.S. Mint than any other denomination. In August, the Mint produced 440.4 million of them. That represents 60.8% of all circulating-quality coins struck for the month. Dollar coins and Kennedy half-dollars are no longer produced for commerce. As such, the U.S. Mint only makes enough of them to fulfill collector demand. Native American $1 Coins have not been produced since January and presses have been silent for Kennedy half-dollars since April. For a second straight month, the Mint made Presidential $1 coins but in limited quantities — 10,000 in August and 3.36 million in July. United States Mint plants in the cities of Philadelphia and Denver are tasked with producing all coins for commerce. For the January through August period, the Philadelphia Mint struck 4,251,370,000 coins and the Denver Mint produced 4,058,750,000 coins. Both facilities have a combined year-to-date total of 8,310,120,000 coins, marking a 30.3% increase over the 6,379,660,000 coins struck through the first eight months in 2012. This year’s monthly average of more than 1.04 billion coins would place the annual coin production total above 12.4 billion coins or the most since 14.4 billion were minted in 2007. Demand continues to climb for America the Beautiful Quarters. Preliminary mintages were published for the Fort McHenry National Monument and Historic Shrine quarter that launched into circulation on August 26. Mintage splits for the Fort McHenry quarter are 151,400,000 from Denver and 120,000,000 from Philadelphia for a combined total of 271,400,000. The Fort McHenry quarter mintage total is second highest. 2012 Denali quarters leads them all at 302 million. 2013-P Fort McHenry quarters have the third highest mintage of Philadelphia struck quarters. They fall behind the immediate prior 2013-P Great Basin quarters at 122.4 million and last year’s final 2012-P Denali quarters at 135.4 million. 2013-D Fort McHenry quarters have the second highest mintage of Denver produced quarters. 2012-D Denali quarters lead at 166.6 million. America the Beautiful Quarters are higher by 6,800,000. These are likely starting mintages for 2013 Mount Rushmore quarters. This last America the Beautiful quarter of the year is scheduled for a circulation launch on November 4, 2013. If the trend since 2011 continues, its mintage will be the highest of the year. Presidential $1 Coins are higher by 4,200. Next month’s report should offer clarity as to this difference. All circulating coin production figures above are based on data aggregated from the United States Mint webpage found at: http://www.usmint.gov/about_the_mint/?action=coin_production. Looks like Chaco is the key to the quarter series unless we have another big recession prior to the end of production. A nice overview!